There are many ways to explore Frogtown, but there’s only one perfect way to spend a day in the L.A. River-adjacent neighborhood. We’ve put together an itinerary for your perfect day in Frogtown. Start your day in this Los Angeles River–adjacent neighborhood with a stop at Spoke Bicycle Cafe. If your bike needs tuning, send it over to the repair shop, then order a bagel and kombucha at this garagelike neighborhood hangout. If you need to borrow a set of wheels, the rental shop has all sorts of cruisers at hourly and daily rates. Either way, pedal through the café’s dedicated entry to the river’s bike path. This paved byway has become the neighborhood’s main car-free artery, with a cluster of cafés and restaurants along its tree-lined channel south of the 2 freeway—make sure to stop by the Frog Spot for a snack and to learn more about life along the river. Recaffeinate after your ride at La Colombe. The industrial-chic café doubles as the specialty coffee company’s bean supplier for the rest of its L.A. locations. Head around the corner to grab lunch at Wax Paper, a small aluminum shed that prepares small-batch sandwiches named after NPR personalities (seriously). Try the Audie Cornish, a classic French-style ham sandwich gussied up with homemade honey butter. Pedal to Frogtown’s northern edge to wash down your lunch with a pour from Frogtown Brewery. The cozy microbrewery serves a cultivated, eclectic menu: Make sure to order the Dark Times American stout, with notes of coffee and chocolate, or the Man Da Rin, an American pale ale with just a hint of kumquat. 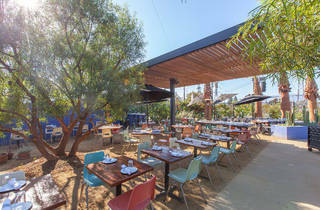 Sit down for tacos and palomas at Salazar. 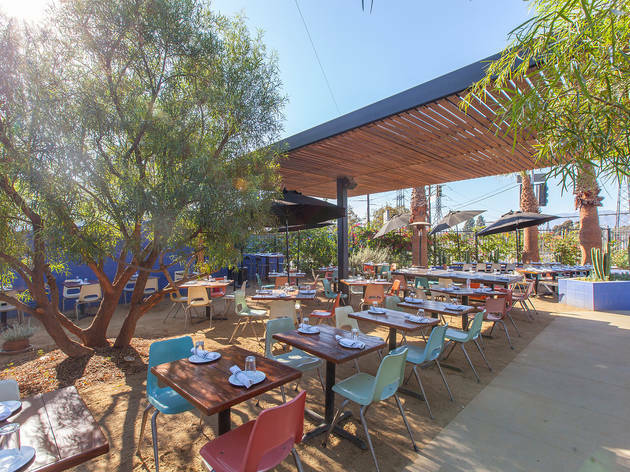 The colorful alfresco eatery specializes in fantastic tortillas and mesquite- grilled meats, and its patio’s olive and palm trees frame a gorgeous view of the San Gabriel Mountains. For the rest of the evening, hole up next door at Zebulon. This Brooklyn transplant’s chill patio and low-key café turns into a lively cocktail bar in the evening as DJs and live bands (past performers include indie darlings like Andrew Bird and Thurston Moore) take over its small stage.